How Do I Want to Show Up in the World? Last week I came back from a week at a summer camp for women. Talk about a situation ready to send you right back into your junior high insecurities: a bunch of women sleeping in the woods, swarmed by mosquitoes, constantly sweating in the moist North Carolina air. We shared our cabins with mice. We shared our showers with spiders. We logged fewer hours sleeping than I normally do at home with my teething baby. It was the kind of environment just uncomfortable enough to let others see glimpses of your heart. My heart? It was insecure. Lonely. Needy. Afraid. Longing for my own bed and my husband’s reassuring arms. This was the first time I’d been away from my 10-month old son for more than 24 hours. I’d already been gone for two days and I had five more to go. Without his tiny body hugged to mine, I hardly knew who I was. What would I talk about? The exhaustion I embody and the extra pounds I carry seem more acceptable somehow when I am carrying him in front of my soft belly. Without him I felt exposed. I was bombarded by self-doubt the minute I drove up to camp: Will anyone want to sit with me at dinner? Will I make friends? Will I be fun enough? Will people think I’m boring and wonder why I’m even here? 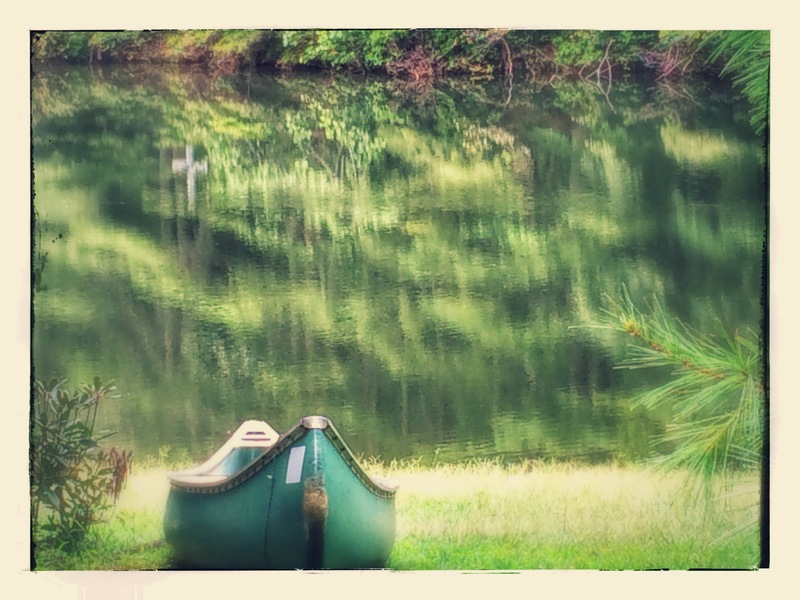 All my giftings that made me excited to be a camp counselor—my capacity for compassion, my ability to listen, my leaning toward grace—were darkened with shadow. All I could think about was how quiet I can be, how slow I am to make friends, how I will always choose quiet time over an afternoon of lawn games. In short: I began to wonder why I was even there. Thankfully, the women attending camp were big-hearted women seeking joy and love and truth, women who speak and live with grace. Women who desire to show up fearlessly, exactly as they are, leaning into the beauty of who they were created to be. Each woman I spoke with radiated warmth and gratitude. Each woman had a ready smile. As I journaled on our first morning there, I realized the problem wasn’t with camp, it was with me. These feelings of inadequacy weren’t bubbling up only because it was the first time I was away from my son or because I was losing sleep to the song of the cicadas. My feelings of unease were very familiar: I spend so much time and energy wondering and worrying about what other people think, about which parts of myself I should show them to make them feel more comfortable, that I hardly remember the design of creation. I hardly remember I am made in God’s image, reflecting his glory in a unique blend of the many facets of his character. Rather than wasting time and energy focusing on how I fall short or fail, I wanted to lean in towards the person God created me to be. How do I want to show up in the world? How do I want to be remembered? From that moment on, each time I began to feel the pinch of doubt or the rush of fear, I stopped, took a breath and asked myself how I wanted to show up in the moment. Would I let destructive patterns of self-protection keep me from engaging with others? Or would I trust that God had equipped me with all I would need? I asked myself how I wanted to be remembered. When I was honest with myself I knew it wouldn’t be for winning any games or making people laugh or telling a moving story in front of the whole camp. But maybe I could be remembered for the connections I made with others, for being vulnerable in my cabin, for making others feel safe to share the truth of their own stories. So that’s how I showed up: a little quiet, a little awkward, a little scared. But I showed up anyway. And the conversations I had with the women who crossed my path were some of the most heartfelt I’ve had in a very long time. Maybe this is who God created me to be. How do you want to show up today? How do you want to be remembered?